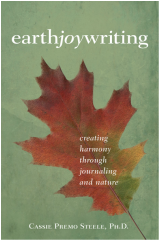 "Filled with respect for the shifting seasons of the earth and our creative lives, and rich with exercises and insights, this book is a gem for writers at any level." "In order to heal a wounded world, a wounded self, one must simultaneously, lovingly, and curiously enter two wild spaces—our own minds and the world of nature—both with an intent towards germination and discovery." Sometimes it is not only people, but nature, who teach us to see. Once I was leading an Earth Joy Writing workshop in which I asked people to walk through the woods to find symbols that reflected who they were, who they were becoming, and what they needed to know for their becoming. We were walking along, and suddenly in front of us was the gorgeous trunk of a tree, almost silver in its glowing smoothness. I reached out to touch it, and it was strong, hard, more solid than the sometimes spongy trunks of pines and other trees in the south. “What is this?” I asked the group. Later, I did some research and discovered that this prickly house ornament was originally a tree that can live for a hundred years or more, growing up to fifty feet tall with a spread of up to forty feet in diameter. Mature American hollies can have a trunk up to eighteen inches, I learned later, and the one in front of me in the woods that day was at least a foot across. In my research I also discovered that Native Americans had boiled the twigs with the pine tops to make a tea for coughs. Then, when the Pilgrims landed just before Christmas on Plymouth Rock, they saw the American holly, and it reminded them of their English holly, and they took it as a sign from God. It’s a dioecious plant, which means it needs both male and female for fruit production. It’s also the females that make the beautiful red berries we have come to love. These berries are a major food source for winter-migrating flocks of birds all along the eastern seaboard, such as the cedar waxwing and the American goldfinch. So this is how we begin to co-create: by paying attention to the landscapes and living beings around us; knowing their histories, habitats, and habits; and supporting their survival and their lives. Years have gone by since the day I found that holly tree, and now I find myself living in a new place. And in my new backyard, right now as I write, are two beautiful holly trees, each over fifty feet tall. What I had found in the woods, did not know and had to “research,” had become a companion to me, sharing my home. This is my wish for you, too: that nature will no longer be “out there” for you, that it will become part of your life, your intimate companion and teacher and guide. May this book inspire your Earth Joy Writing for many years. I feel blessed to be on this journey with you in this way. I wish you joy and creativity and a life of balance with yourself, others, and our wonderful earth.